Ergonomic Paddle can be depressed with the palm of the hand for easy folding and unfolding of walker. The handles lock-in when the walker is opened. 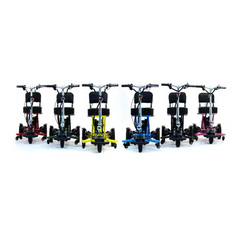 Walker wheel and glide accessories are available. 300 lb. (136.1 kg) weight capacity.